Coach Thomas has been the Boys Team Head Coach for Emerald City for about 14 years. He grew up as a gymnast and excelled in high school and college, serving as team captain at Kansas State University. Coach Thomas moved here from Las Vegas to be closer to his family in Topeka. Coach Thomas has qualified gymnasts to over 30 national championships and coached 7 national champions. He served on the Junior National Team Coaching staff for 10 years and was Head Coach for team USA against Canada and Japan. Coach Thomas also led the USA Junior National team in Madrid, Spain and the Gym Master International meet in Brussels, Belgium. He has experience coaching upper level girls team gymnastics as well. 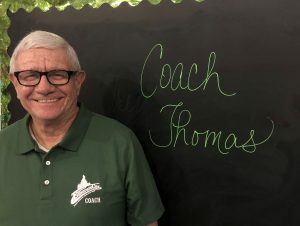 Outside the gym, Coach Thomas enjoys riding his bike, reading, watching TV and movies and participating in church activities. To contact Coach Thomas, email coachthomas@emeraldcitygym.com. Coach Cesar started gymnastics at the age of 3 in Mexico. He qualified for the Mexican Junior National Team at 8 years old. 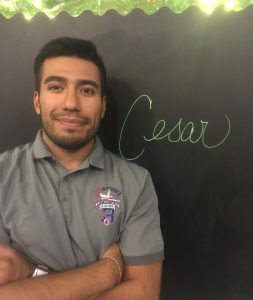 Upon moving to the U.S. at the age of 9, Cesar began competing for Emerald City at Level 6 and continued his career through his Junior year of High School. Cesar competed on the High School wrestling team for 2 years and qualified for State during his last year. He graduated from Blue Valley West High School in 2009 and continued on to Kansas State University to earn his bachelor’s of science degree in Kinesiology and Exercise Physiology in 2014. In 2015, Cesar earned a National Certification as a Personal Trainer through the American Council on Exercise. 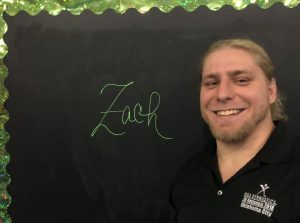 He also became a Certified USA Weightlifting Sports Performance Coach and earned a CrossFit Level 1 coaching certification, both in 2016. Although Cesar has 9 years of gymnastics coaching experience, he has been part of the Emerald City family for 3 1/2 years. Cesar lists his greatest accomplishments as coaching Emerald city’s USAG Boy’s level 6 and 7 state championship winning teams for several years. In his spare time, Cesar enjoys the outdoors including rock climbing, hiking, mountain biking, kayaking and camping. He also enjoys traveling, experiencing new cultures and eating just about anything. Cesar lives in Lawrence and has a cat named Ash that knows how to sit and meow on command. He aspires to never stop learning about the human body and movement, and to one day have a healthy and happy family. To contact Cesar, email emeraldcityks.cesar@gmail.com.